John Andreas Schwert was born on February 27, 1888, in Buffalo, New York. He was the third child of John and Augusta (née Lorenz) Schwertfeger/Schwert. John was baptized on March 4, 1888, at Saint Boniface R.C. Church, 124 Locust Street, Buffalo. At the time of John's birth, the family probably resided at 18 Willow Place in Buffalo. John was wed to Lillian (née Stein). John's obituary indicates that they may have had only one child: a daughter, Gladys. John and Lillian resided, at least during their later years, at 34 W. Cleveland Drive in Buffalo. John died on April 15, 1947, of pancreatic cancer. Lillian died on June 18 1961. 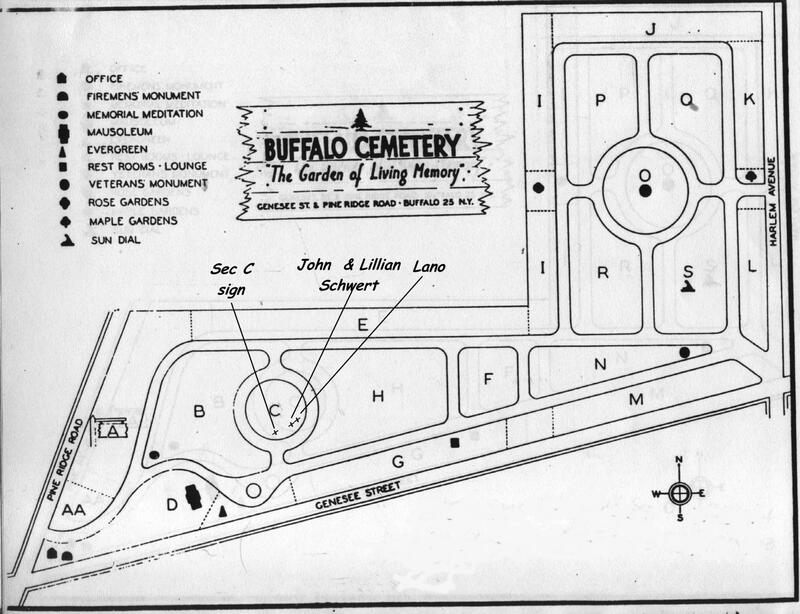 Both John and Lillian are interred in Section C, Lot 102, Buffalo Cemetery (Pine Hill), Cheektowaga, NY. 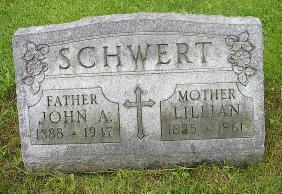 Johann (John) Schwertfeger / Schwert: Born 1858; died 1938. Gladys (née Schwert) Prawel: Born 1910; died 1998. 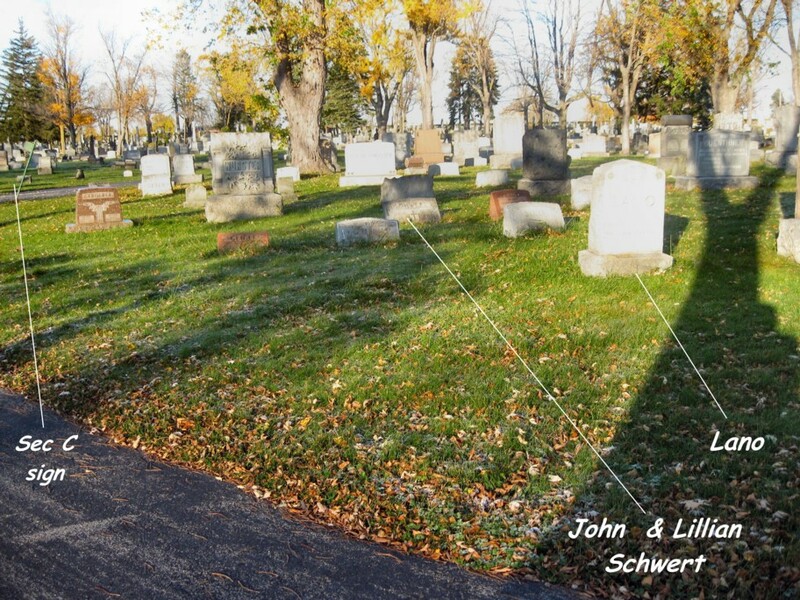 General location of the graves of John Andreas and Lillian (née Stein) Schwert, Section C, Lot 102, Buffalo Cemetery (Pine Hill), Cheektowaga, NY. A map to locate the gravesites is here. 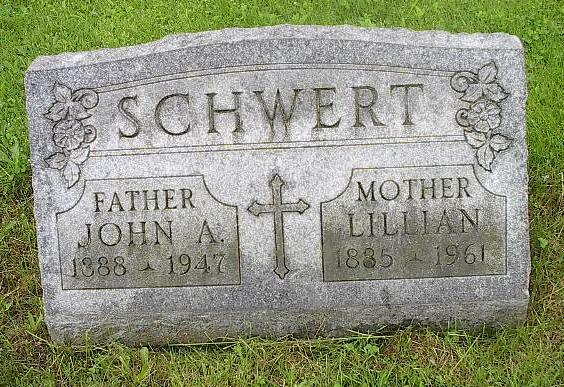 Grave of John Andreas and Lillian (née Stein) Schwert, Section C, Lot 102, Buffalo Cemetery (Pine Hill), Cheektowaga, NY. 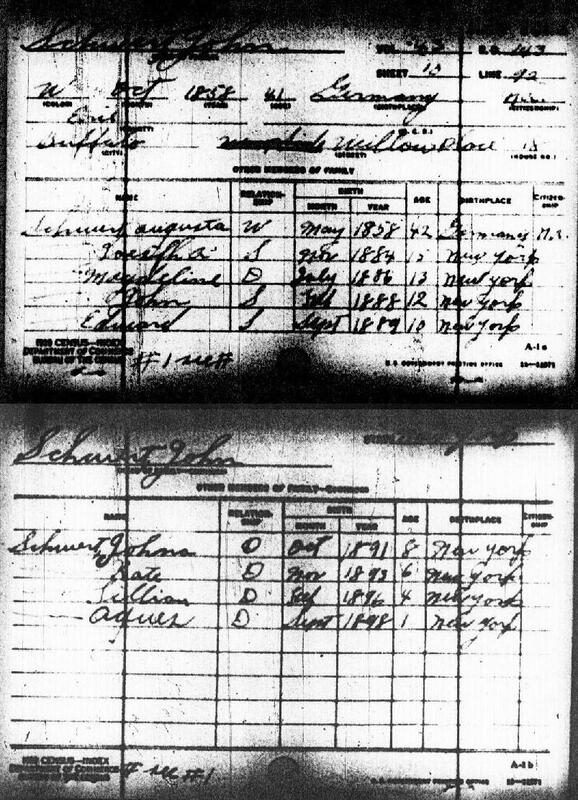 Baptismal Record: John Andreas Schwert, born on February 27, 1888, and baptized on March 4, 1888, Saint Boniface R.C. Church, Buffalo, NY. 1900 U.S. Census: John and Augusta (née Lorenz) Schwert, and family, 18 Willow Place, Buffalo, NY. 1920 U.S. Census: John and Lillian (née Stein) Schwert, with their daughter Gladys, residing at 4 Mulberry Street, Buffalo, NY. 1930 U.S. Census: John and Lillian (née Stein) Schwert, with their daughter Gladys. For reasons that are unclear, John's named is recorded as "Robert." 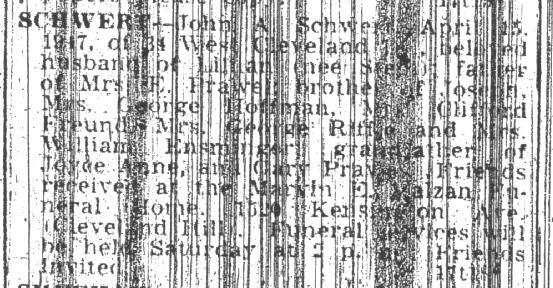 Obituary: John Andreas Schwert, April 15, 1947. 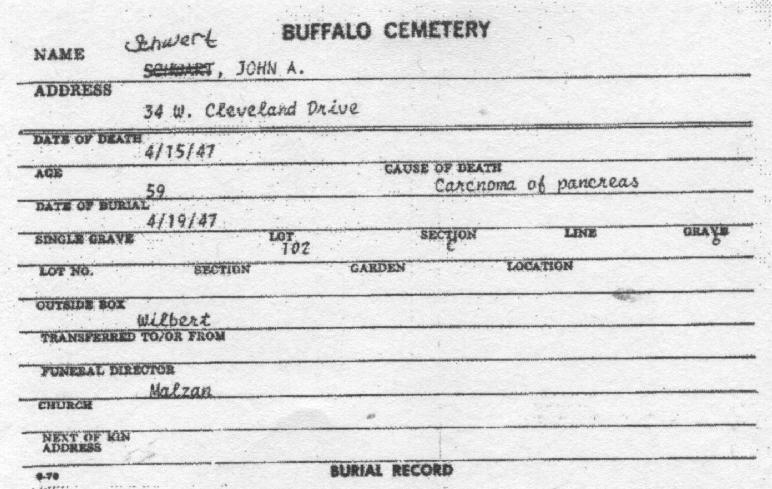 Interment Record: John Andreas Schwert, Section C, Lot 102, Buffalo Cemetery (Pine Hill), Cheektowaga, NY. Interred April 19, 1947. 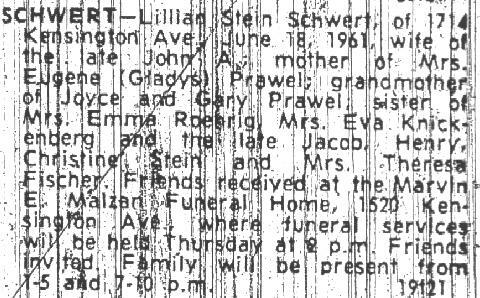 Obituary: Lillian (née Stein) Schwert, died June 18, 1961. 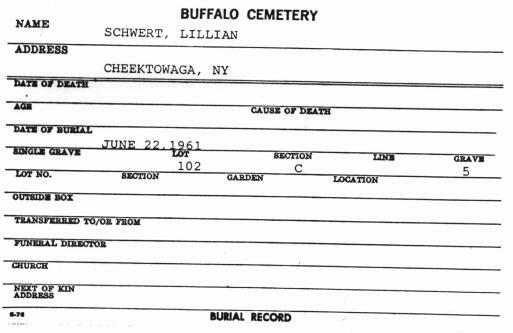 Interment Record: Lillian (née Stein) Schwert, Section C, Lot 102, Buffalo Cemetery (Pine Hill), Cheektowaga, NY. Interred June 22, 1961.